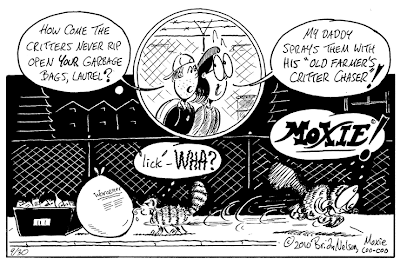 Sunday on the Block with Laurel: Make mine Moxie! Our gal Laurel enlists carbonated warfare against trash-day pests in this week's TelegramTowns. Love this. I live in a Moxie-filled household (we're talking Moxie in toddler's sippy cups). "Clap hands, here comes Charlie!"